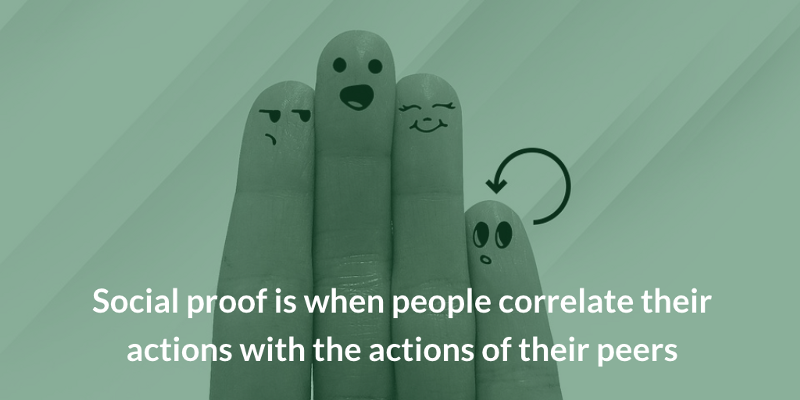 In essence, social proof happens when people correlate their actions with the actions of their peers. It’s when someone looks to others for the validation and guidance of their own behavior. As social beings, we subconsciously search for cues and clues in both our physical and digital worlds as to how to act in a way that “fits in” and won’t offend our social norms. Thus we are drawn to content on the internet that has had more shares or is otherwise deemed more popular by the network it resides within. Additionally, studies show that we’re most influenced to purchase products that our peers have purchased or talked about. When it comes to product design, we can manifest social proof in a number of ways including user reviews, testimonials, customer quotes and stats representing the product’s usage amongst a potential user’s peers. Our design decisions happen around when and where to use these positive social cues in order to influence new users within our on-boarding flows to increase engagement. The Baremetrics sign up form includes a testimonial as social proof at this critical moment in their user on-boarding flow. This process can be organic and naturally occurring when, for example, a potential user asks her Twitter following about their experience(s) using your product. However, this organic flow leaves out the potentially massive impact your product’s intentional design can have to answer these questions for the user. By being proactive and providing social proof throughout your new user on-boarding flow, you are able to control the situation, putting potential new users at ease and increasing your product’s conversion metrics. So, who’s doing this really well right now? In my design research, I identified a few products that are currently doing an killer job of leveraging social proof in their design. 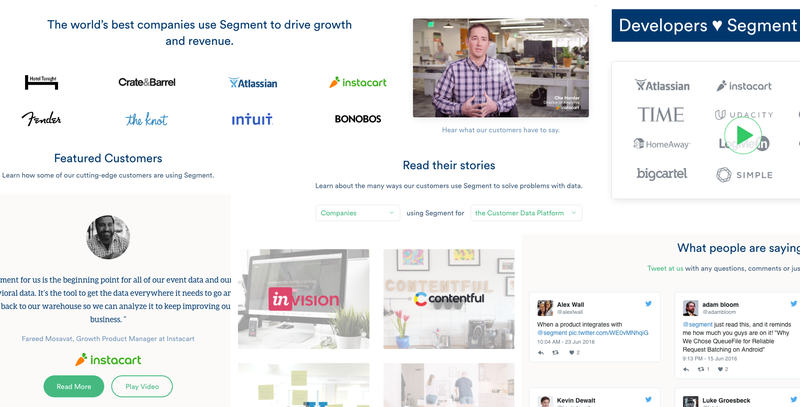 Segment’s website is littered with great examples of social proof. They lead with a strong customer experience video, positive quotes and companies who use their product. The site goes in-depth on customer use cases on their customers page, leaving no doubt as to their positive reputation. Segment’s use of video was especially powerful, making them stand apart. Sidenote: Segment’s website has a killer, clean overall design aesthetic. Nice work. InVision takes their social proof a step further, including it throughout the on-boarding flow itself. 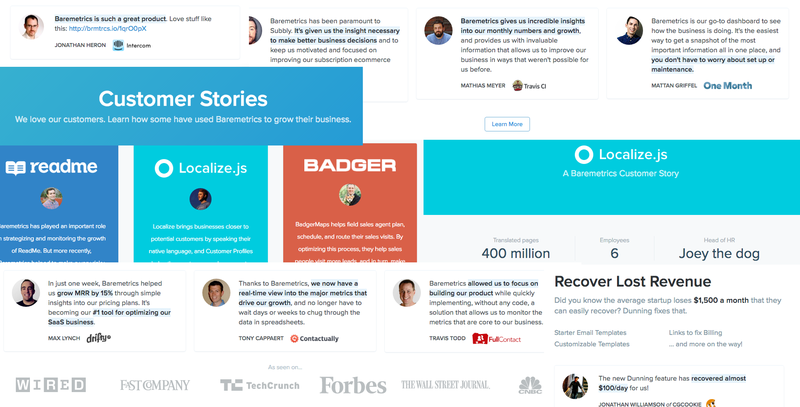 See some examples here of positive customer quotes right alongside key product interactions, such as new account and actual content creation. 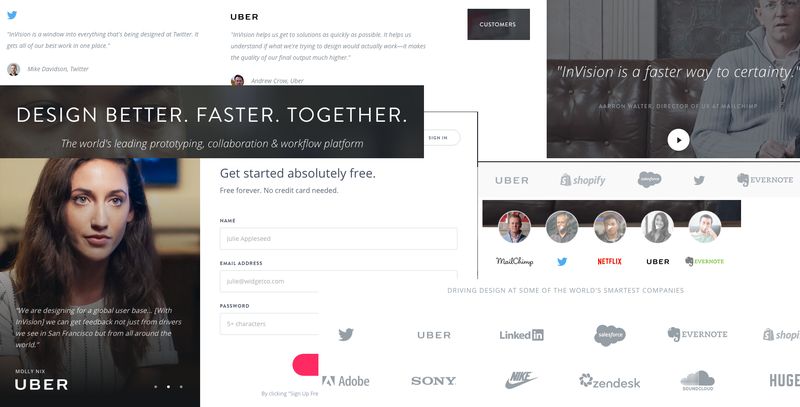 The InVision Blog is an additional goldmine of social proof examples. Baremetric’s use of social proof also permeates the entire website and flows though to the key interaction points of the product. As you fill out the sign up form, a smiling face and positive testimonial are right next to the form, letting a potentially hesitant user know it will all be ok.
Baremetrics uses social testimonials and badges heavily and successfully throughout their marketing website. So, for an excellent return on your time invested, go forth and add some effective social proof to your product’s on-boarding flow(s). Test your hypotheses, talks with your users, and come back to these examples as inspiration during your next iteration.